I've been thinking about the "Imagi-Nations" concept that some of the 18th century wargamers (and/or just history enthusiasts) indulge in. It got me thinking about something similar for an ancients campaign. Would that be "Imagin-Ancients"? If no one else lays claim to that, I declare that I've officially coined the term. When I have time to start gaming again in another 4-6 weeks (oh, I see the sun rising on the horizon!) I may work up a map and some simple rules as an excuse to try to organize a small campaign. 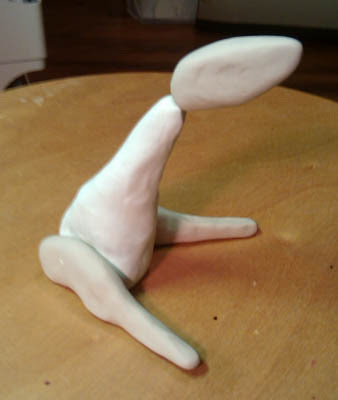 Not really wargame or miniatures related, but I've started working on a small but long overdue sculpting project. I formed out some of the massing last night. I'll reveal more as it evolves. "Hey, can I put Arkham Horror (board game) on our Amazon wedding registry?" Sculpting?Is that a Cluzzle game,I guess it will be interesting especially when the players will guess the objects you create made out of clay.Fun and exciting,wish to made it by my cousins. Sculpting is a hard thing to do. It takes a lot of great control from your hands and a great imagination just to finish one.